There are two traditions in Britain that I truly hope never fade: Ascot Ladies Day (a day where I can wear the most ladylike tea dresses and truly fabulous hats without anyone batting an eyelid) and afternoon tea (one of the only meals where I can justify eating sugar on sugar and not feel bad about it). These two traditions might be something that we can only indulge in once in a while, but they're definitely something to be enjoyed and savoured whilst they're happening. I have my fair share of afternoon teas in a year - birthdays, anniversaries, and sometimes I make a mini afternoon tea at home if friends are coming over - and when I can't go to Ascot, I love seeing the outfits online. If you've ever experience one or both of these activities, then you'll probably have some idea of the kind of enjoyment and nostalgia they bring to mind. So wouldn't it be amazing if the two were combined? I'm not talking about something as standard as sitting down for afternoon tea at Ladies Day. That would be pretty average - and I didn't put the word 'exclusive' in the title of this post for nothing. I'm talking about wearing afternoon tea. This doesn't mean a cake-based food fight (I couldn't bear the thought of all that cake going to waste). No, when I say 'wearing afternoon tea', I'm on about Dorset based bakery Thomas J. Fudge's afternoon tea inspired biscuit bonnet. AKA, a hat inspired by afternoon tea. 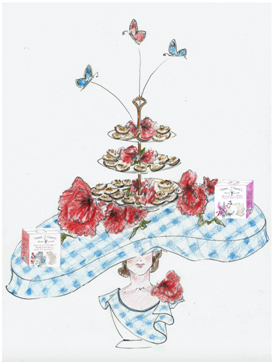 Featuring a spread of real Florentine biscuits, arranged on a tempting table setting complete with cake stand and pale blue gingham ‘table cloth’, the hat means racegoers need not choose between a bite of afternoon tea or a flutter on the horses! How's THAT for a showstopper? This creation will be modelled at Ascot Ladies Day on Thursday 16th June. So if you're going this year, make sure to keep an eye out and see if you can snap a photo. Now, if you've never had a Thomas J. Fudge's florentine, shame on you! They are possibly my favourite biscuits on Earth. Actually, no, they ARE my favourite biscuits on Earth. With a creamy chocolate base and sweet, sticky flaked almonds and sultanas on top, I salivate just thinking about them. I could easily eat a whole box, especially with a cup of English Breakfast and some neatly cut salmon and cream cheese sandwiches to top it all off. Food for thought, eh?